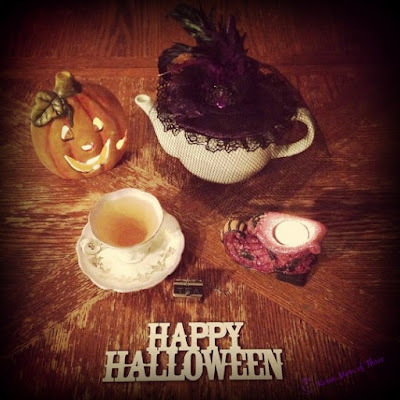 Happy Halloween Early Morning Tea and Reflection. It is Halloween, I can not believe it, it is finally here! 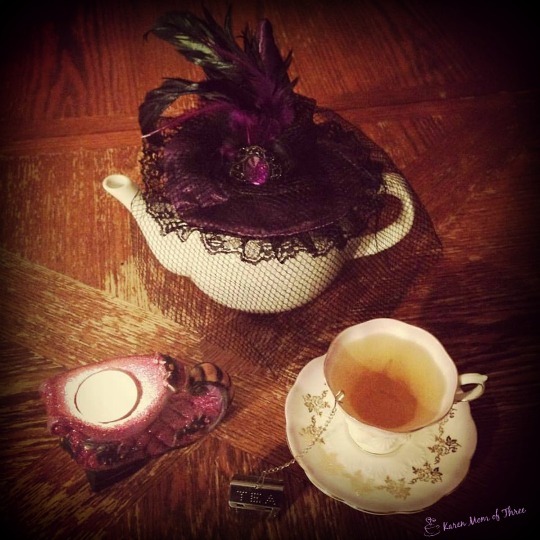 I also can not believe I waited this long to put the hat on my tea pot! Love how that looks! I was given a lovely treat in the mail yesterday by my friend Lisa of Lisa K's Book Reviews I got my very own little tea house shown above. It was such a welcome surprise from such a lovely lady! 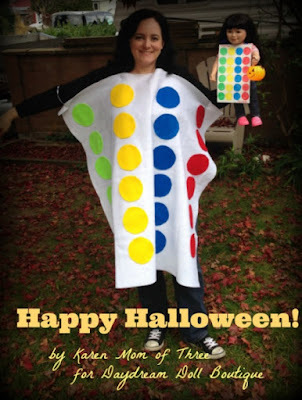 I hope that you all have a very blessed and safe Halloween. Looks like it will be a very soggy one here! I have purchased 100 Koolaid Juice Boxes to hand out again tonight. I have done this for the last several years and the kids love it, by the time they get to my door they were always asking me for something to drink so I decided a few years back to try this and everyone loved it. Don't worry I have something for the littlest trick or treators too not everyone wants the juice! Thank you for joining me for A Cup of Tea and A Cozy Mystery this morning. I hope to see you again tomorrow. Well it is Halloween Eve Morning and I am trying to have a tea party for one. I was up most of the night, between the cats and the excitement of wear your costume to school day, sleep has alluded me. 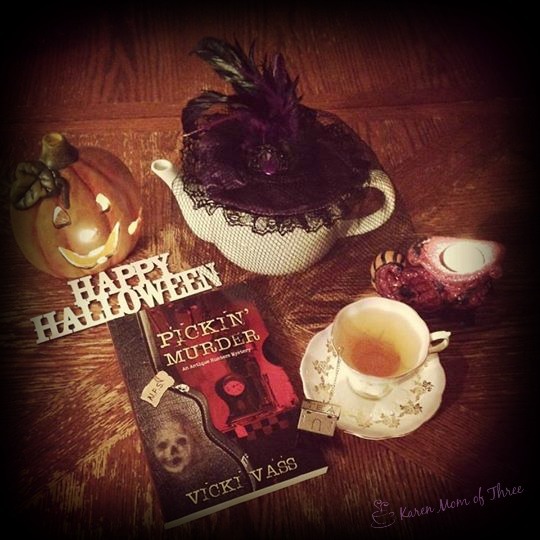 I started Pickin' Murder by Vicki Vass yesterday and am already enjoying it. 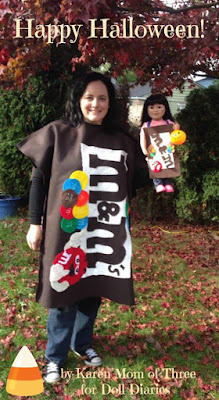 Here is a sneak peak to what my two younger kids are wearing to school today, I made both costumes and (am modeling them for you)and well, I did not take into account the monsoon weather we are having so I hope that the costumes make it all the way through school today and not act as giant sponges. You may notice I made doll sized versions as well, these are for my paid doll writing work and they were actually an after thought. Oliver's M&M costume turned out so well I was really excited to see it in doll size too, my youngest Alex wanted to be a twister board and the spinner is his hat but I am not wearing it in the photo. Good thing I am all of about 5 feet tall so should ever the need arise I can borrow either costume. Don't worry though I will be sporting my regular hat tomorrow though for school today I have a slightly more fun facinator style. Squirrel and I wish you a very Happy Halloween Eve and we are off to try to steal a moment to read between going to the grocery story for treats for the Trick Or Treator's and back to school for the Halloween Parade. 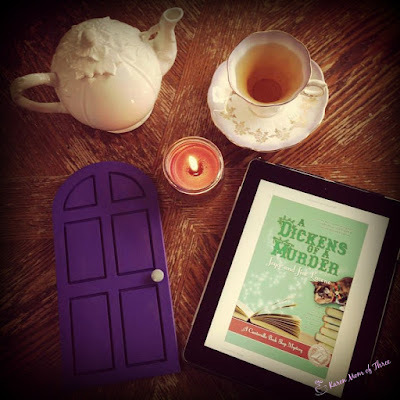 A Dickens of A Murder by Joyce and Jim Lavene A Haunting Great Read! I just finished A Dickens of A Murder by Joyce and Jim Lavene and it was wonderful. I do not know how Joyce and Jim are able but I am surprised and taken aback by the wonderful stories they tell. Truth be told it was bitter sweet to read this so soon after learning of Joyce's passing and yet I really felt her in the story and it made it all feel so much more real. I laughed when while reading this book, I cried and I felt love and friendship through out this cozy. 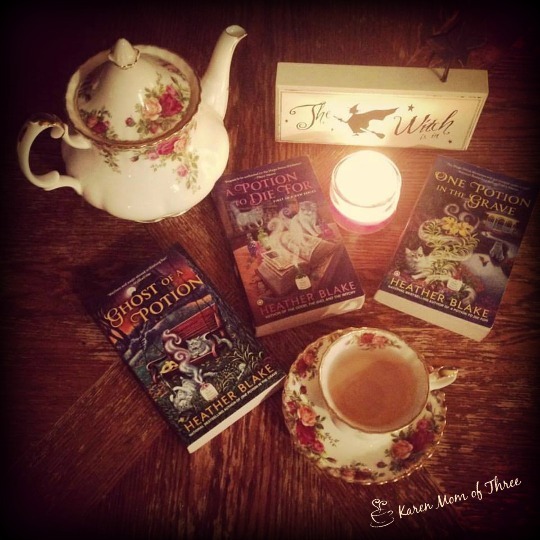 I love the idea of turning an old Victorian into a book shop, I love the idea of long lost love, amazing authors and true friendship. 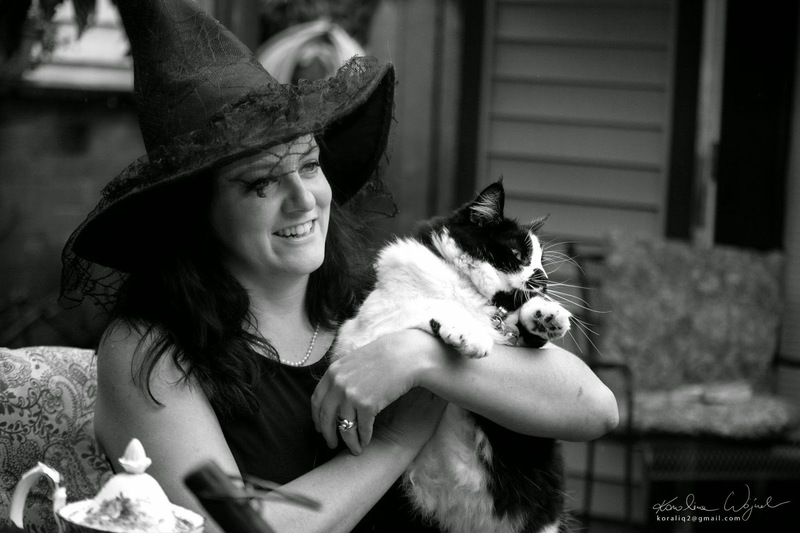 I also loved the many animals that belong to the Caterville Proprietors Lisa and Simon. 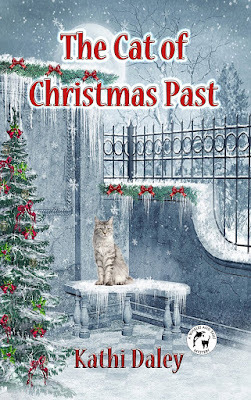 I could picture each of them in the old Victorian and see their personalities with the wonderful descriptions that one comes to expect in a Joyce and Jim Lavene mystery. I loved that there are cross over characters from other fantastic stories that Joyce and Jim have written but I wont tell you who. 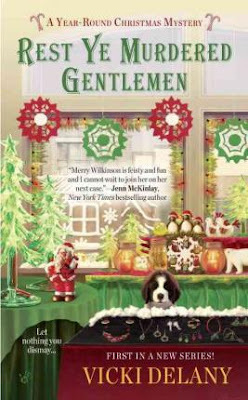 I had a wonderful smile when I realized what was happening in the story and I was amazed at how naturally these characters flowed in this mystery. 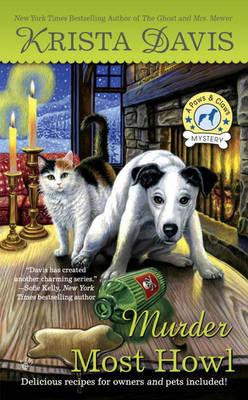 It is a very good mystery, a very touching cozy and one I am so thankful I got to read! I was so very honored to have been sent this Advanced Reading Copy by Jim Lavene it was very well written, wonderful and witty. It is truly a haunting good read. A Dickens of A Murder will be out November 3rd and you can pre order your copy on Amazon by clicking here. 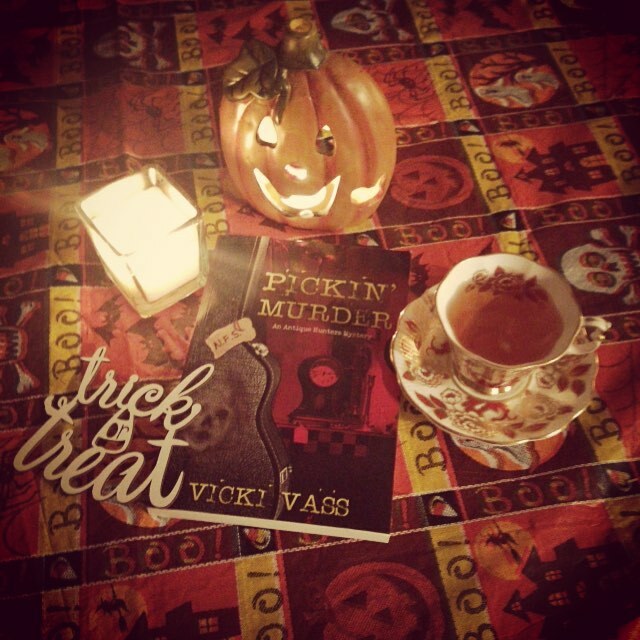 Thank you so much for joining me for a cup of tea and this cozy mystery review. 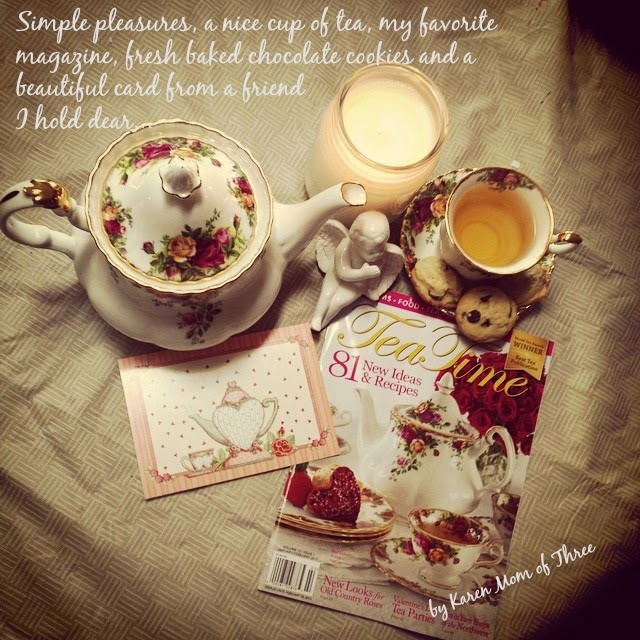 I was enjoying Fortnum and Mason's Black Tea with Cranberry, perfect for a Thanksgiving themed cozy! 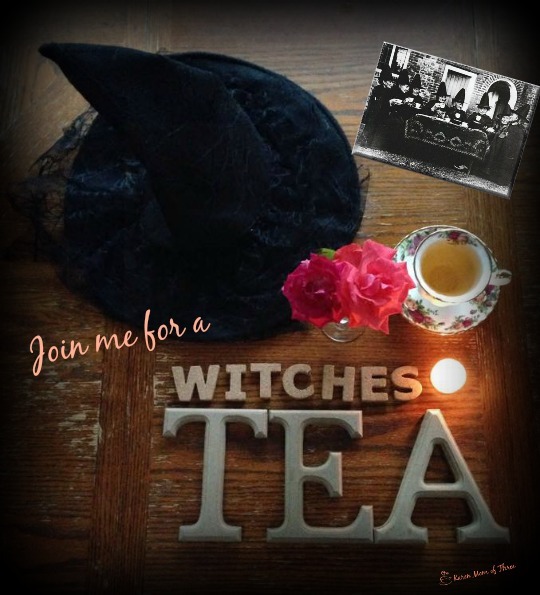 I know it is not even Halloween, but the items I have found for tea lovers from Santa this year require shipping and with the international shipping dates looming I think it is okay to share with you these wonderful items I found on Etsy. 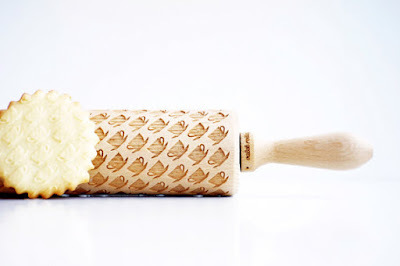 The top of my wish list currently is this amazing rolling pin from ValekRollingPins, which embosses your cookies with a tea cup pattern. 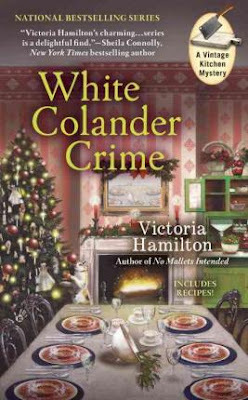 This is a definite must have in my books I do love my cookies, my tea and my cozy mysteries...this one priced at only $34.04 US is clearly worth the money and the shipping to me in Canada is an additional $13.05 and something I may just have to order for myself. See it on Etsy by clicking here. 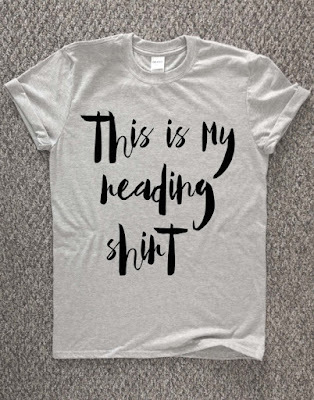 They do custom printing as well, I could go nuts with combinations! MinnieandMaude have some wonderful pillows and this one caught my eye, offered at $18.99 this would be a welcome addition to my reading corner. Click here for shop and listing. The Watermelon Factory has this wonderful shirt that made me laugh, offered at $20.43 this is a very cute gift idea for a book lover for sure. Click here for shop and listing. Even though I love my tea cups and saucers I think this mug is perfect! Offered by Enchanted Prints this mug is $17.99 and I think it is over sized to boot! Click here for shop and listing. 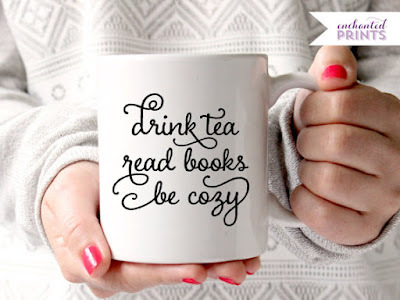 Thank you for joining me for a cup of tea some on line shopping and a great cozy mystery. 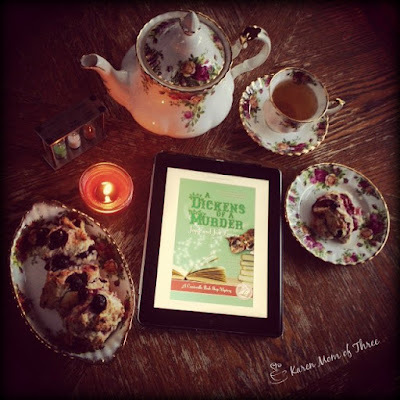 I am so enjoying A Dickens of A Murder out November 6th. 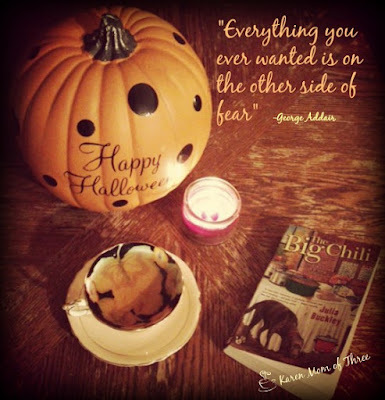 The Big Chili By Julia Buckley, A Great Story About Feeling The Fear And Choosing To Live Life Anyway. I just finished The Big Chili, sent to me by my friend Karen to read and review and I have to tell you that it was pretty darn good. 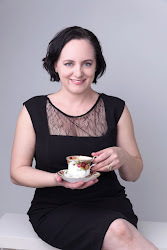 The idea of the book is that main character 27 year old Lilah Drake is finding her own way after a failed relationship with the help of her family and some really good clients her super secret "covered dish" catering service. The story has a pretty good mystery and I thought I knew who the killer was really early, which disappointed me as I often don't figure it out but Julia wrote this story well and I was truly surprised in the end. I enjoyed the fact that this mystery was taking place the same time of year and week that I finished it. I love it when that happens! I also liked that on the morning I finished The Big Chili that I came across a quote by George Addair that I think not only applies to my life but it very much did to the story I was reading as well. The quote on the first photo above is "Everything you ever wanted is on the other side of fear"
I have thought about the quote all day and evening and that is so true, fear can be an insurmountable barrier to success and debilitating but it also maybe the only thing standing in your way. Sometimes the right book and series finds you at the right time and this book was that for me. I truly enjoyed this first in series and I look forward to reading more about Lilah's next adventures. To order your own copy of The Big Chili please click here. 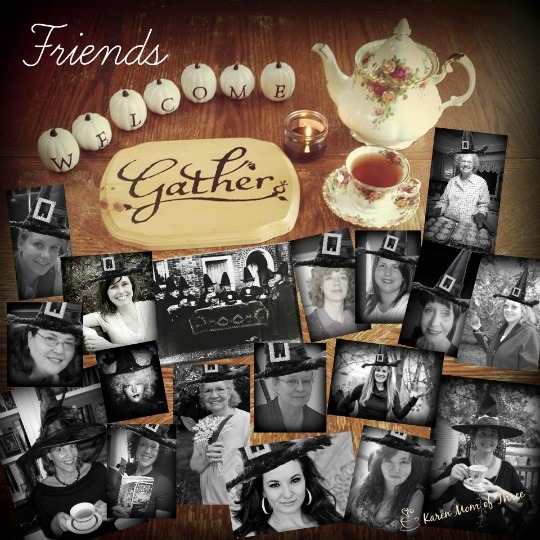 My friends I am so thankful that you have joined me again for tea and a cozy mystery. I am still struggling with the news that Joyce Lavene is no longer with us and spent much of the weekend thinking about her, her family and connecting with other fans and friends of Joyce and her husband Jim's work. 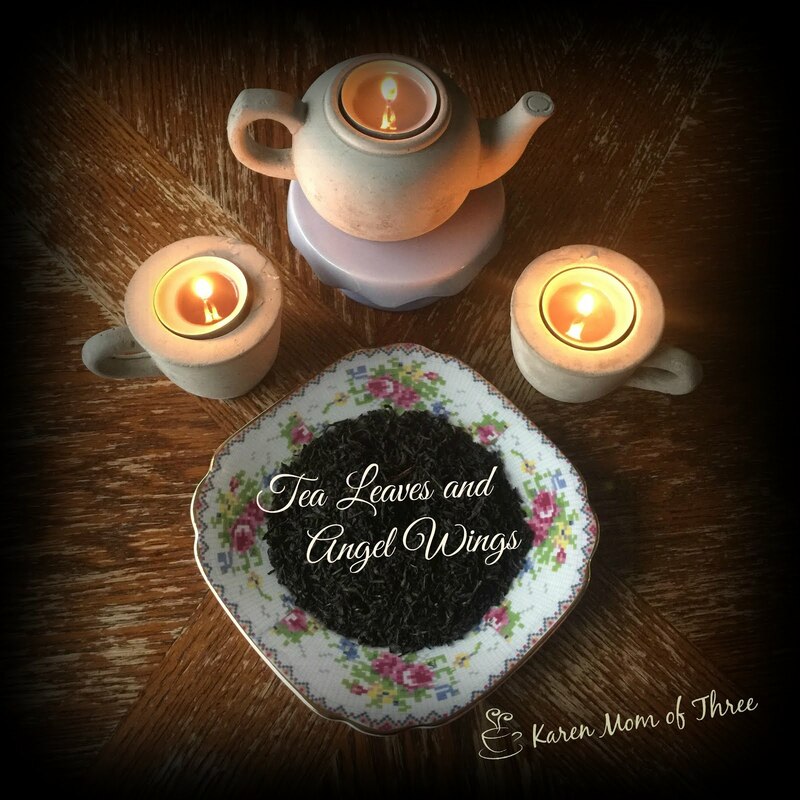 Yesterday my friend Lisa hosted an on line Memorial Event in her honor and I made some scones and tea to share virtually on line for the event. I was thrilled to receive my ARC of A Dickens of A Murder from Jim, and I am thankful and looking forward to being able to read it and share it with all of you. It comes out on November 6th and you can pre order by clicking here. Line a cookie sheet with parchment paper and drop equal sized and spaced spoonfuls of scone batter on the cookie tray. Bake at 400 until the sides and top are golden brown. 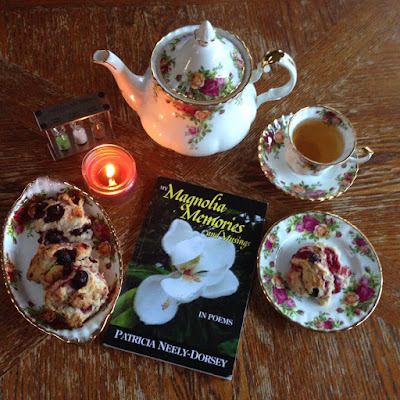 Serve with your favorite tea, some butter or Devon-shire cream a great cozy mystery or your favorite book of poetry. Today I am sharing a tea craft I have just created in memory of my friend Joyce Lavene. 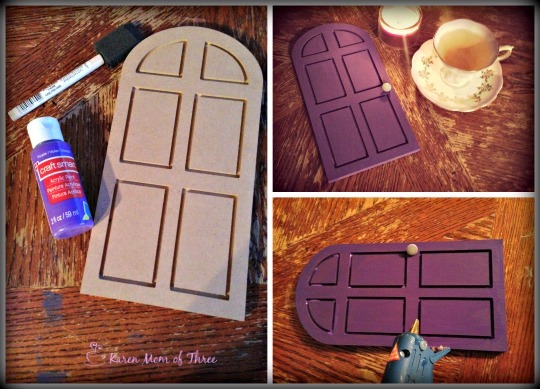 I have always loved Enchanted Entryway Doors and I wanted to make one and really make it my own. Enchanted Entryways, known to some as fairy doors or doors to the other side are a whimsical way to invite "others" into your life. 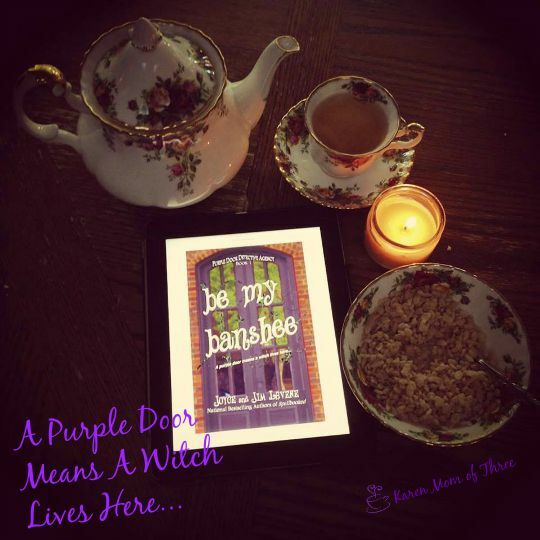 Earlier this year I read a wonderful book by Joyce and Jim Lavene called Be my Banshee, a Purple Door Detective Agency was where I learned of the purple door lore. 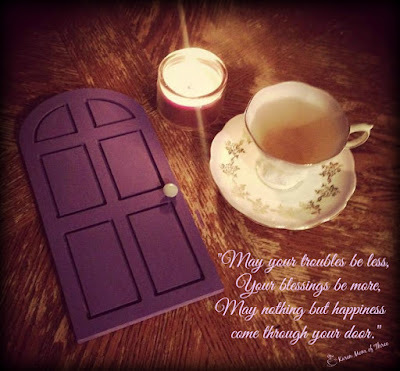 It is said that a purple door or a gate way lets others know a witch lives here. I created mine with my friend in mind and in keeping with lore, I have painted it purple. I do love purple and some of my favorite books Joyce and her husband Jim wrote were about witches, fairies and other magical creatures that I love reading about. Enchanted Entryway's make wonderful gifts for the very young to the very old. 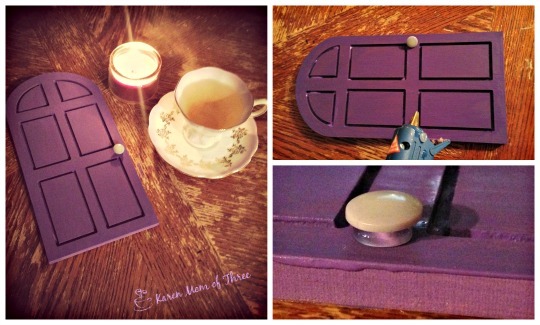 They are popular on Etsy and other companies who specialize in Fairy Doors. Here is how you can make your own. Step 1- Paint the first coat on your door, make sure to get all the edges and allow to dry completely between coats. Step 2- Be sure to paint the sides, top and bottom of the door. Step 3- Once you are happy with the coverage of your paint on the door and it has dried, plug your glue gun in and select the button you wish to use for the knob and figure out where you want to place it. Add your glue and press the button or hardware into place. Allow it to dry. Step 4- Touch up any spots with paint that you feel need covering. Step 5- Once dry you can attach it to your wall or lean it against a special spot on a shelf near your books and tea. I love how mine turned out and I think my friend would have approved. 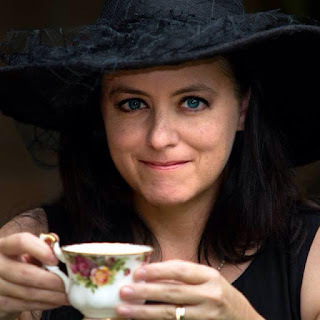 Thank you for joining me for a cup of tea and a cozy mystery. 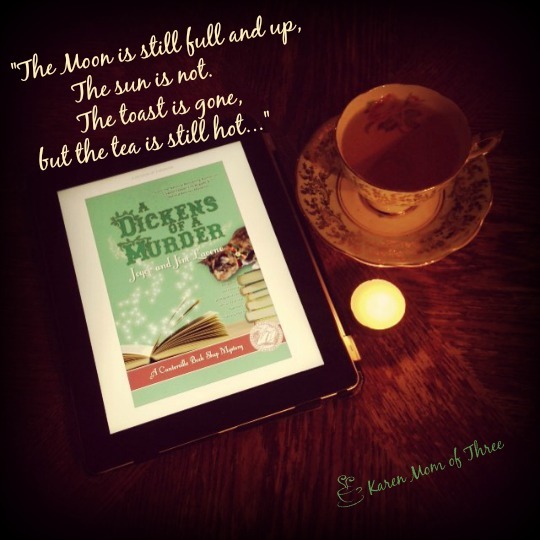 A Dickens of A Murder by Joyce and Jim Lavene is coming out November 3rd. You can order your own copy by clicking here. 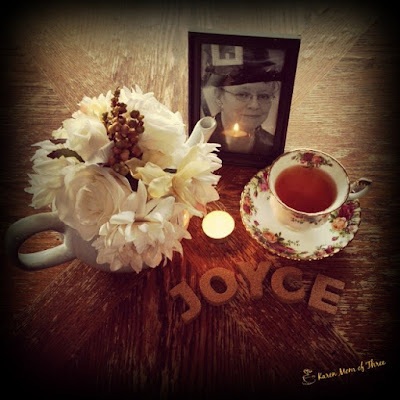 This week on My Table and In My Cup I would like to start by expressing my sadness and shock at learning that author Joyce Lavene passed away on October 20th. 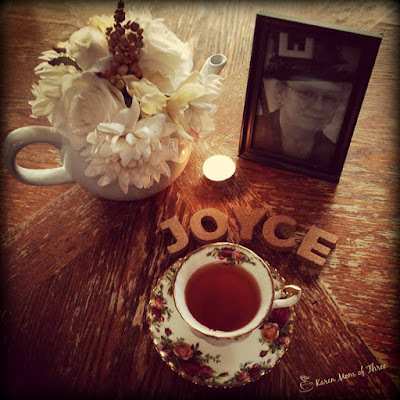 Joyce was so much more to me then an amazing author who reached out to her readers. 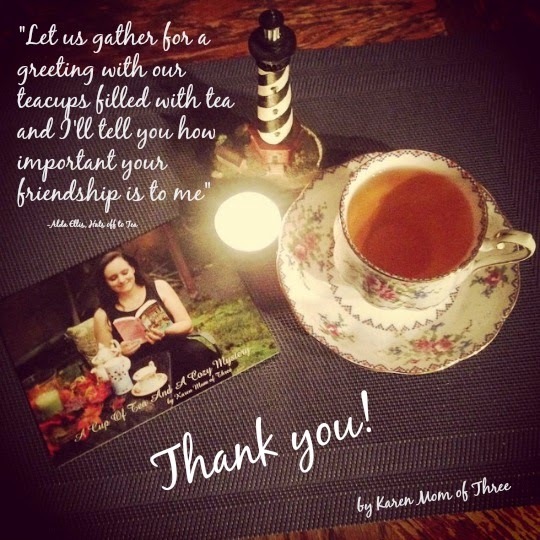 To me she was a friend and mentor, she honored me by commenting on my daily tea photos and included me in her early review copies of her and Jim's amazing stories and she became one of my biggest supporters here on my blog and in my work. Joyce and I last exchanged messages on Facebook last Friday and I was so shocked upon my return from camp this week to learn that she had passed away. My heart goes out to Jim and the rest of Joyce's family as well as the entire cozy community. Joyce was my friend, a lady I so respected and an incredibly talented author. I feel so very blessed to have been able to have known her in this way. 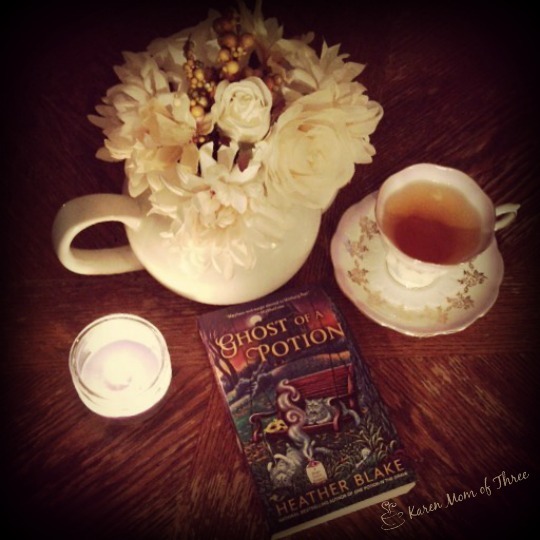 Earlier this week, I finished Ghost of A Potion by Heather Blake this week and loved having it in my table. 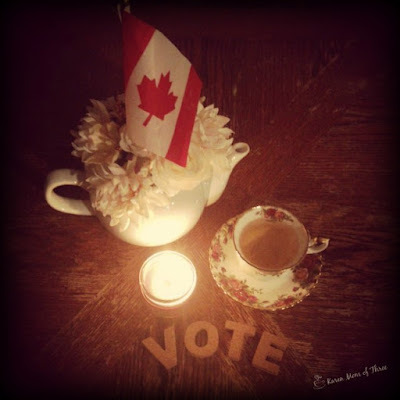 This Monday Canada voted and we now have a new Prime Minister, Justin Trudeau of the Liberal Party was elected with a Majority. I exercised my right to vote and expressed my pride in the ability to do so with my morning tea photo. 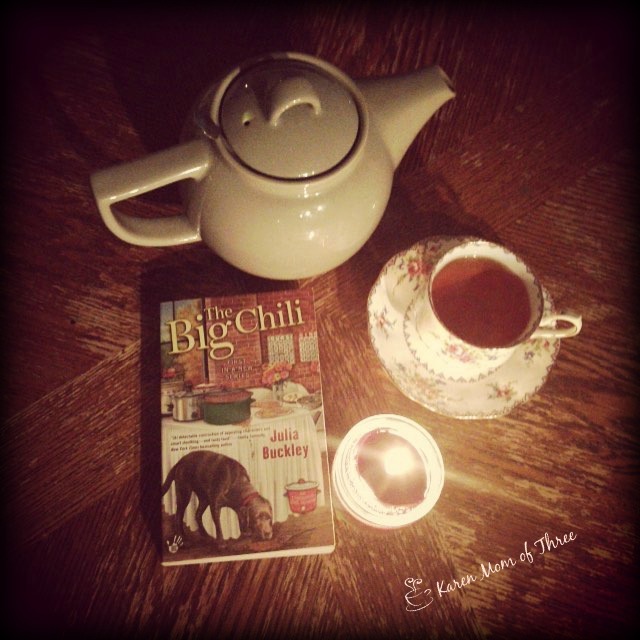 I started The Big Chili this week by Julia Buckley and while I was away my Tea Time Magazine Subscription Arrived! 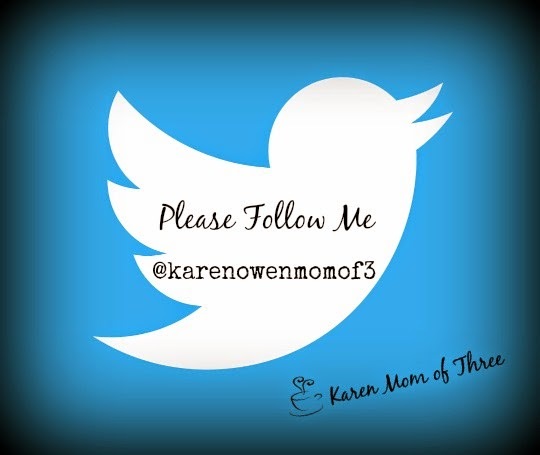 Thank you so much for joining me for a week in review and a tribute to my friend Joyce Lavene. I finished Ghost Of A Potion with a sigh and the realization that I now have to wait like a year for the next one. Such a fun series. 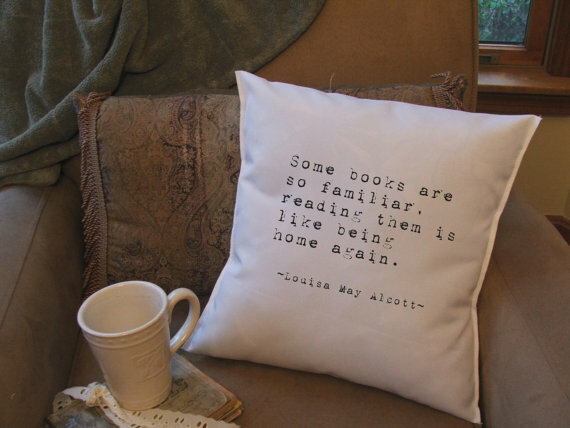 I also enjoy reading books at take place at the same time of year that it is in reality makes everything seem so much brighter and realistic! This series is filled with outrageous characters such as Carly's Mother, her boy friend Dylan's Mother, not to mention Carly's Aunts the Odd Ducks, this story was even more intriguing with the idea that Carly and her Cousin Delia helping lost soles fulfill their last tasks so that they may cross over to the after life. Carly is suffering from Spectraphobia in the beginning of the story and I was right there with her! However as it was such a key component of the story found myself warming to the idea. The way the story unfolded was a very big help. Heather Blake writes with humor, passion and style. 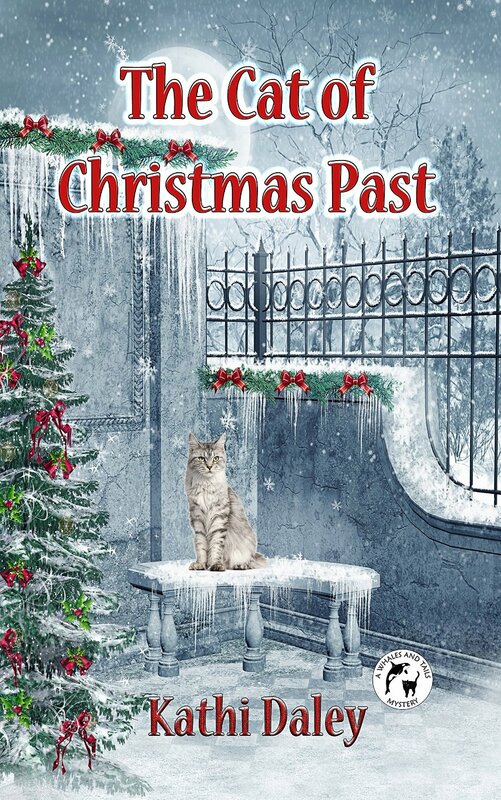 I am looking forward to seeing how Carly and Delia fair in their next adventure and I hope to see more of Carly's Aunts in the next Hitching Post Cozy Adventure. 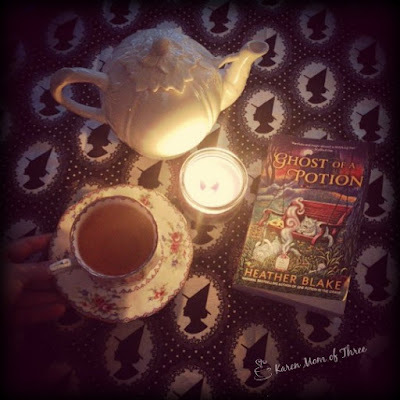 To order your own copy of Ghost of a Potion please click here. 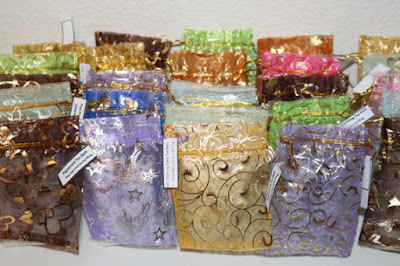 Tea Bath's On Etsy A Great Gift To Give Or Receive. 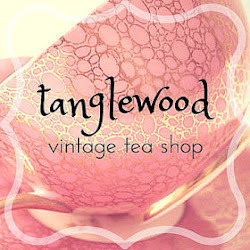 Bath Tea's on Etsy are the theme today, actually I am thinking the theme for tea party favors, Christmas holidays and more. I am a bath person, I understand that many of you prefer the shower but I think the bath is one of my most favorite places to be. 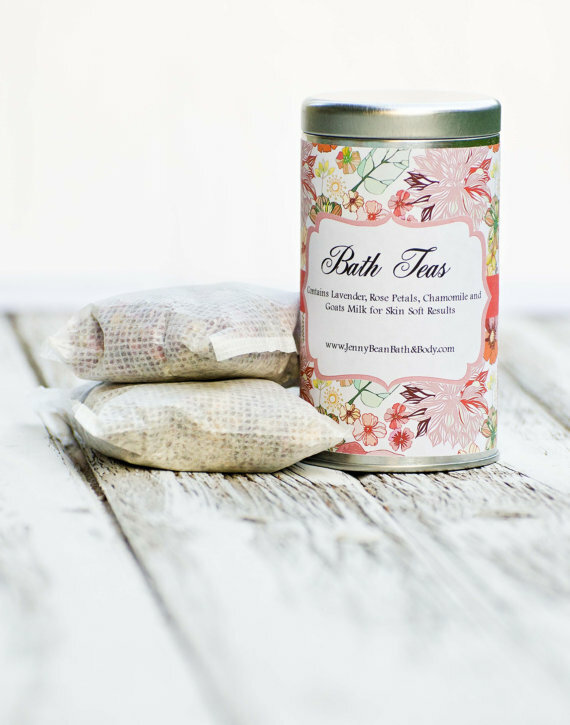 These bath tea's sound right up my alley! Not to be drunk but to soak in, I am very inspired by the following listings. The first one (shown above) is offered by Jennybeancandles etsy shop this one contains "an aromatic blend of Roses, Lavender, Spearmint, and Dead Sea Salts. 2 bath teas included in one packet. 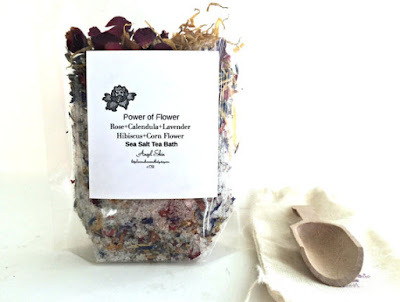 We've also added Goat milk and coco butter for a nice skin soft bath" sounds great to me click here for more information on how you can order your own bath teas from Jenny. Next up is from the shop with a very cleaver name "A little goes a long way" you can order your bath tea's in a variety of scents with this listing and they come in such delightful bags! 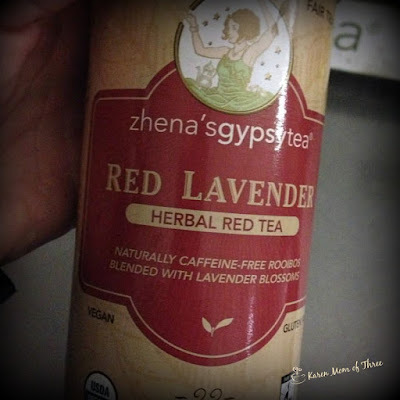 click here to learn more about these bath teas. I hope you have fun shopping on line or in store to find bath teas for yourself or for the tea lovers in your life. November Releases To Get Excited About! White Colander Crime by Victoria Hamilton comes out in just a few weeks and I am love the cover of this one don't you? How could one not pick this book up this holiday season. I could move right in couldn't you? Currently offered with free delivery on The Book Depository for $7.15 click here for more info. Vicki Delany also has one with a cover I just love coming out the same day! Check out the puppy! How cute is he? Click here to learn more about this November release. Kathi's covers get me every time, I can not tell you how much do I love the Whales and Tails series by Kathi Daley! Out November 1 click here for the Amazon listing for your kindle! I had to double check I had pre ordered this one. Krista Davis has Murder Most Howl out at the end of November and this is another series I think is fantastic. 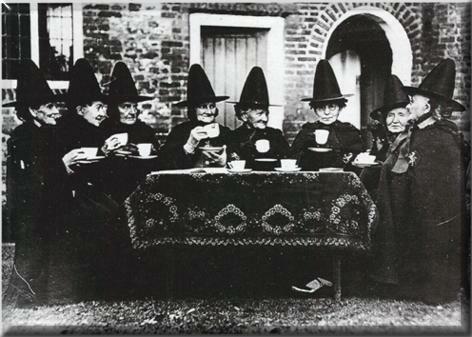 Late last Spring I put out the invite to my friends near and far to join me this summer for a Witches Tea party. 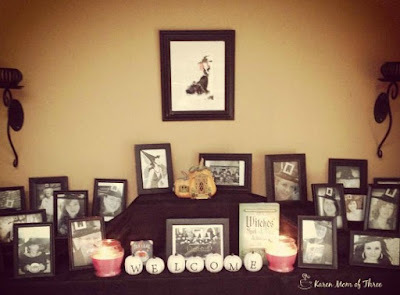 My goal was to recreate the Witches Tea Party shown in the Iconic photo on my invite and here below. I had an overwhelming response of wonderful friends, authors and new acquaintances who wanted to join and many of them live so far away but expressed their desire to attend the party in someway. I asked each of them for a photograph, some had hats of their own some I added hats too and the party by proxy became a reality. I used Pic Monkey Soft-wear and I added hats to my friends who sent in photos with out hats, I love how it turned out it was as if we all belonged to the same "Coven" with our matching hats. 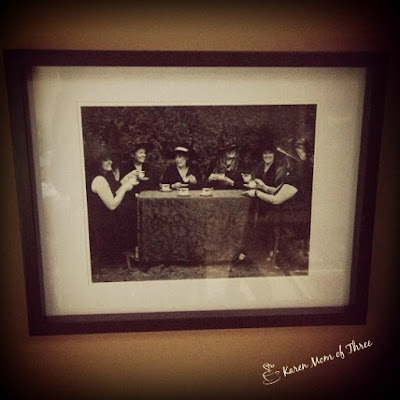 I then framed all the photos and used my fire place to make a focal point for the party, so that my friends from far could be part of the party. I was beyond excited the day of the party, I had been making treats and tea and getting ready to host my local friends for our tea party when something rather unexpected happened. The Forces of Nature, invited themselves to tea. We had the most spectacular wind storm our area has ever seen. Winds upwards of 90 kilometers per hour from the south hit the Lower Main Land of British Columbia, where I live, causing 700,000 people to be with out power, some for up to three days. Do I know how to throw a party or what? I had just boiled a kettle of water for the tea when the power went out, The table cloth would not stay on the outdoor table but boy did we have fun! 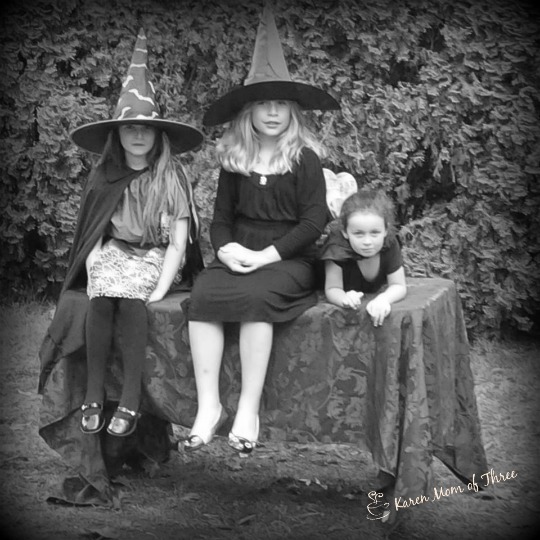 Shown in the photo above are some of my young witch guests who became the defenders of the cloth...table cloth that was, while we set up for our photos they sat on the table protecting our cloth from flying away. I think in the bottom right (photo above) from the party you can see the stress of the lack of power and tea in my face. By the time the individual photos were taken it was pretty clear that the elements were taking their toll. I had so much fun though, despite everything that happened with the weather. I have some really amazing friends and I have a very fantastic photographer and friend Karolina, of Karolina's Photography who braved the elements to capture the beauty of the day as well. I love my framed photo from the tea party that now hangs on my wall. 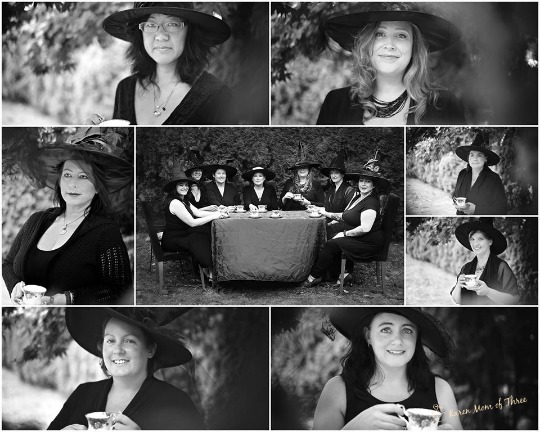 a reminder of how I put the call out and my friends came together in August, with the power and force of the elements to help me create the most fun photo story and themed tea party I had all summer. I had such a fantastic time that I plan on doing this again next year and with all the photos we had done and all the photos of my friends near and far, next years party should be even more wonderful. I hope you will come next year too! 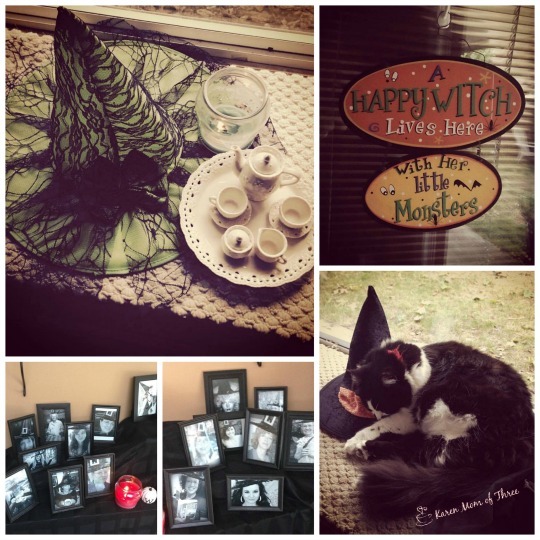 Decorating For Halloween Tea Time Craft Window! Finished What's A Witch To Do? 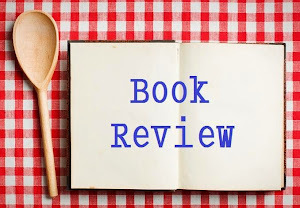 Sunday Soup Recipe and A Great Cozy Mystery! 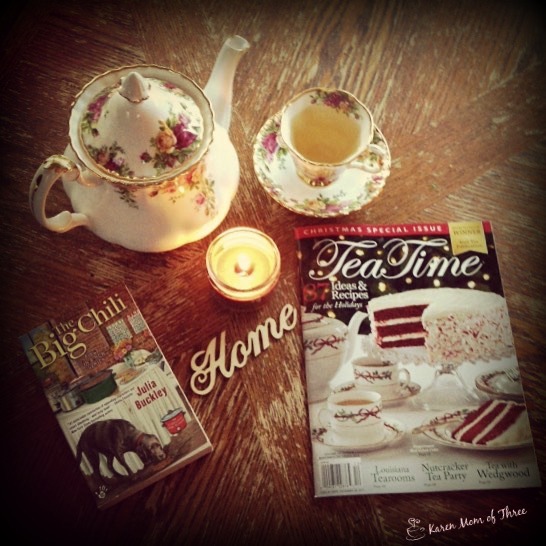 A Give Away And A Few Great Tea Time Books! 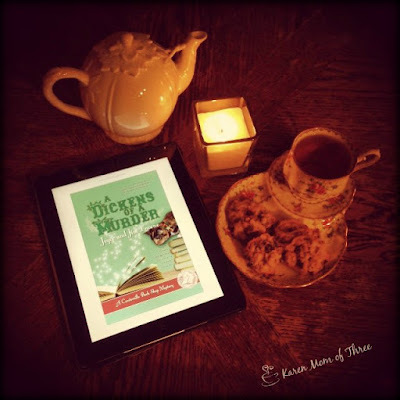 Murder By The Spoonful Is A Fantastic Read!